I am fascinated by perceptions; how they are formed, how they change, and how off the mark they usually are. This guy is probably great at tuning up a Harley, but he’s likely not very smart, right? That is, until you discover that he’s a heart surgeon. Perceptions can drive us to do things we never had to do, say things we never had to say, even feel things we never had to feel. Think about that. If I perceive that you’re angry with me, I’d feel horrible. I might act nervous around you. I might do something stupid like send you a harsh email or angrily confront you. Suddenly, I find that you were never angry at me at all. In fact, you were just having a bad day or something. What a waste of stress! Sometimes our perceptions have nothing to do with reality. We should be more careful. We should examine our perceptions and leave the door open to the possibility that they are totally off. I’m friends with a beautiful woman. Not just pretty…pageant pretty. After a few months of working with her, I formed the perception that any girl would kill to be her. Any man would kill to be with her. I envied her beauty and wondered what that must be like. I would have bet the house that her life was amazing. Not long after, I found that behind that killer smile there was heartache. She struggled with her body image. She often over ate and then starved herself. Her husband wasn’t a good man and he cheated on her. When she found out, she went through a divorce. For a long time she felt ugly and alone. Flawless, it turns out, isn’t always flawless. I’m not sure what the answer is, but I suspect that if we see each other, really see each other, it could make all the difference. This guy I know is doing something really cool. He’s calling it “100 Cups in 100 days.” In the course of 100 days, he’s going to sit down for a cup of coffee with 100 different people. He is inviting friends, acquaintances, even strangers to share their stories, their struggles, even their pain. He wants to learn from their experiences. He wants to help or encourage. He wants to go beyond perceptions. I’m accepting his invitation, although if I drink coffee I’ll throw up. Whether it’s something as drastic as 100 meetings or one simple phone call, maybe it’s time we work harder to connect. Perceptions are formed quickly based on very little knowledge. Reality takes time to discover. Isn’t it time? 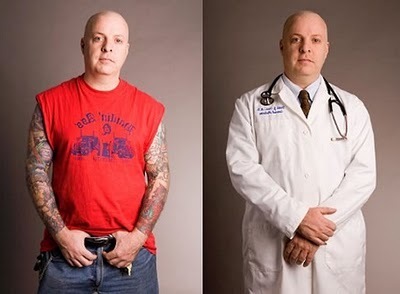 Maybe your doctor rides a Harley on the weekends. And maybe he can save your life.